Hukamnama Sahib today is on Ang 813 of Sri Guru Granth Sahib Maharaj Ji by Sri Guru Arjun Dev ji in Bilaaval Raag. Satgur Arjun Sahib Maharaj Ji is speaking in Bilaaval Raag today. Soee maleen deen heen jis Prabh bisraanaa. Maharaj ji says that person who has 'bisraanaa'- who has forgotten Waheguru, and what does it mean to forget Waheguru? Each one of us is continually thinking of something- continuing meditating upon something. And you may ask, how is this going on? Within each one of us, while we are sitting down, if we're sitting, we're not saying a word with our tongue- our mind is running through a thousand thoughts- the mother is thinking about her child, the businessman is thinking about his business, and in the same way, thoughts are dwelling through the minds and the hearts of everyone. But Guru Sahib Ji says that is in our hearts, there is no remembrance of Waheguru, no remembrance of God, then Guru Sahib Ji says 'soee'- that person is maleen'- means filthy, 'deen'- means poor, 'heen'- means lowly,. Gur Sahib Ji says that person is not filthy who does not have outer clothes to wear , who does not have silk or satin clothes to wear, that person is not poor who doesn't have worldly money , who does not have pounds or dollars or rupees in his pocket. That person is not lowly who is born into a certain social class, or into a certain background. Guru Sahib Ji says, instead, that person is lowly, poor, and filthy who has forgotten God. Why? Because if we forget God, what happens? Our heart becomes full of ego, anxiety, greed, fear and hatred. Satgur Paatshaah Ji says that by forgetting God, we are losing the greatest wealth in this world, the wealth of God's Name. Bu forgetting God, we are lowly, because we break ourselves from the source of all virtue, Waheguru. Just as we read in Rehraas every day, Satgur Paatshaah Ji says, 'Nanak Naavai baajh sanaat'- without the Name of God all of us are lowly, it's not because somebody is born in a rich family, instead it depends on where the person meditates, whether that person remembers Waheguru or not. Karnaihaar na boojhaee aap ganai bigaanaa. Maharaj Ji goes on to explain, what does it mean to forget God?? That person does not 'bujhaee'- does not realise, does not understand, the 'Karnaihaar'- that Waheguru who has made this whole creation. 'Karnaihaar'- means the Creator. Does not think about, does not meditate upon, 'Aap ganai bigaanaa'- 'bigaanaa'- in this Shabad, has been translated by Professor Sahib Singh to mean 'bay'- 'giaanaa'- now, when we look at the word 'giaan'- we may translate as knowledge, but it's not just talking about worldly knowledge, its talking about the spiritual knowledge. That being is devoid of spiritual knowledge, does not have the knowledge of God, does not have the remembrance of God, and because of that, 'aap ganai'- instead, the human being says, there is no greater being than me, 'ganai'- means to always think that you are the greatest power, that everything is in your hands, and when we start thinking like this, 'aap ganai'- we think everything depends on us, we think about ourselves. This is truly thought based upon ego. Guru Saahib Ji says that the human being, who forgets God, is filthy, lowly and poor because 'Karnaihaar na boojhaee'- he or she has no understanding, has no connection, with Waheguru. He does not even endeavour to meditate upon Waheguru, 'aap ganai bigaanaa'- instead, he or she counts themselves as the highest power. Dookh tadai jad veesarai sukh Prabh chit aa-aay. Guru Arjun Dev Sahib Ji says, 'dookh tadai, jad veesarai'- when we 'veesarai'- when we forget Waheguru, that is when 'dookh'- that is when pain comes. 'Sukh Prabh chit aa-ay'- all happiness, all 'sukh'- all peace comes when we remember Waheguru, 'Prabh'- Lord God in our 'chit'- in our conscience. Guru Piaaray 'dookh tadai jad veesarai'- even if we have all the money in the world, and Guru Arjun Dev Ji tells us in Sukhmani Sahib, even if you were to rule the universe, not this world, not our solar system, if you were to rule all the universe, everything that has been created, 'Sagal srist ko raajaa dukhiaa, Har ka Naam japat ho-ay sukheeaa'- even if you were to rule and control all the universe, even if that was to be under your power, even if you were to be the king or the queen of the entire universe, there will still be pain in your heart. 'Har Ka Naam japat ho-ay sukheeaa'- Guru Arjun Dev Ji says that only by meditating upon the Name of God, can we find 'sukh'- can we find peace. In this Shabad, Guru Ji says 'Sukh Prabh chit aa-ay'- those people who remember Waheguru, in the conscience, they have peace and happiness inside. Guru Piaario, even if those people who are cut in half, their inner peace, their 'sukh' could not be taken away. In these 'tukaa'- lines of Rahaao, Guru Ji says to us 'Santan kai aanandh ayho'- for the Saints, this is the pat of 'aanand'- what does 'aanand' mean?? 'Aanandh' doesn't mean just a temporary happiness, and Sampardaaee Mahaa Purakh, Baba Gurbachan Singh has translated this to mean 'Aanand'- (airraa, nannaa, tipee,), meaning without (daday no onkarr) meaning 'dubidaa'- aanandh is that state of being where is no dubidhaa, no duality, where your mind is not running in two directions, where the mind is completely focused on God, that is true, un-ending happiness. 'Aanand'- is not momentary, it is eternal. The Saints know this to be the path of true peace- 'nit Har Gun ga-ay'- how do they achieve this true peace?? 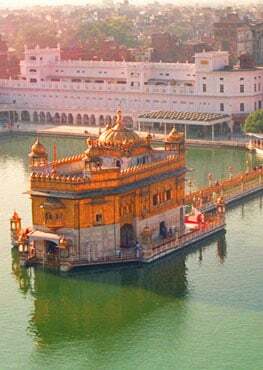 'Nit'- every day, they sing the "gun'- the Praises of Waheguru, every day they chant 'Waheguru, Waheguru'- every morning, with every breath, they remember Waheguru. Rahaao- pause and think about this, Guru Ji says. Oochay tay neechaa karai, neech khin meh thaapai. That person who is on a high position, God is in the power to take that person out of that position of power, and make him or her lowly. God can take those people who are high, and make them low. And those people who are low, 'khin men thaapai'- 'khin'- means in an instant, in a second, Waheguru can 'thhapai'- can establish them, Waheguru can bless them with power, just like the two brothers Phool and Sandali, they came to see Guru Har Rai Paatshaah and they were orphans, and they were beating their stomachs, because they were so hungry. Guru Har Rai Ji said that these two brothers Phool and Sandali, their generations will one day be kings, and the Phoolkia states of Patiala, Naabhaa and Jind, these were ruled over by the descendants of those two hungry children. 'Neech khin meh thaapai'- in an instant, it is in the hands of Waheguru and the Guru, then in an instant, they can take that person who has nothing, and bless them with everything. Keemat kahee na jaaeeai Thakur Prataapai. 'Keemat' - the value of Waheguru, 'kahee na jaaeeai' - cannot be said. How can you put a value, a price on God? No price can be put upon Waheguru; Waheguru is beyond all of this. 'Thakur prataapai' - and no one can put a price upon the 'prataap', upon the glory of Waheguru. This is the Guru's 'prataap', the Guru's power, this is the Guru's glory. No one can put a price upon this. Paykhat leelaa rang roop chalnai din aa-i-aa. Satguru Arjun Dev Ji maharaj says look at all of the different 'leelaa', the different dramas and plays, the different 'rang', the different colours, the different 'roop', the different forms of this world. 'Chalnai din aa-iaa' - but Guru Ji says remember, the day of you to 'chalnai' - the day of you to leave this world - that day is coming. That day when you are going to die, is coming. Supnay ka supnaa bhaiaa sang chaliaa kamaaiaa. Satguru Paatshaah Ji says, that this dream, in reality, when we die, Guru Ji says that this world is really a dream, that's not going to last forever. And when we die, we see that this really was a dream. 'Sang chaliaa kamaaiaa' - all in this world, all the transitory joys, all of the things we did in this world, everything becomes a dream when we die. But the only thing that goes 'sang', that goes with you when you die, is 'kamaaiaa', is the actions which you have done. Karan kaaran Samrath Prabh Tayree Sarnaaee. O Waheguru! You are 'samrath', you are all powerful. You are 'karan kaaran', the one who created this earth. O Prabhu, O Waheguru, O God! 'Tere sarnaaee' - I've come into your protection. O Waheguru! Bless me, so that 'dinas rain' - day and night - I may 'japaai', may meditate upon your name, chant your name. 'Sad sad bal jaaee' - Guru Ji says, again and again forever and forever, I'm a sacrifice to you Waheguru. So Guru Piaario, Satguru Ji is saying, in the Hukamnama Sahib today, that person is filthy, is lowly and is poor, who doesn't have remembrance of God. If you have the remembrance of God, then it doesn't matter how much money there is in your pocket, it doesn't even matter about the clothes upon your back. Satguru Arjun Dev Ji Maharaj says those people who have what Guru Nanak Dev Ji says in Japji Sahib, 'Jis no bakshay sifat salaah, Nanak Paatshaahi Paatshaahu' - those people who have the remembrance of God, they are truly the King of Kings. Not the people who rule over bits of this world. Those who remember God are the true Kings. And Guru Arjun Dev Ji says in Raag Jaitsree on Ang 707 of Guru Granth Sahib ji - 'Bastaa toottee jhhumprdee cheer sabh chhinaa', even though you may dwell in an broken down shack, and have tattered clothes, 'jaat naa pat naa aadaro udiaan bhraminnaa', they may have no social class, no honour, no respect, may be wandering around in the wilderness. 'Mitr na itth dhann roopheen, kicchh saak naa sinna' - they may have no friend, no partner, no wealth, no beauty, no relative relations. 'Raajaa Sahlee srisht kaa, Har Naam mann bhinnaa' - Satguru ji says that even then, he is the King of this whole world, if his mind, if your mind is coloured in the Name of God. 'Tis kee dhoorrd mann oodharai, Prabh hoe suprasannaa' - with the dust of that person's feet, Guru Ji says, people are liberated, 'prabh hoe suprasanna', because that person has pleased God. Guru Ji is saying, 'Dookh tadai jad veesarai sukh Prabh chit aa-aay' - pain comes by forgetting God and remembering Waheguru will give us never-ending Eternal happiness.